On Sunday I bumped into somebody who had recently started attending our church. I was so encouraged after talking with her because it was her third Sunday at Liquid and she was already trying to find a Life Group to get connected to! As we chatted a bit more I found out that she hasn’t attended church since she was a kid … I love talking with those folks! She decided to come and check out our church because 4 weeks ago she found a door hanger at her house. Wowsers! It’s so amazing when it works! Time of Year // Make sure to pick the time of year to do a door-hanger distribution wisely. Even though the Postal Service will deliver through rain, sleet, snow or in the dead of the summer … the chances are that your people won’t want to! Pick a time of year when your people are more likely going to be comfortable outside and walking the streets for a few hours. Distributing door hangers is a great thing to do in the week leading up to a “big day” for your church. Manageable Routes // The postal service already has your town divided up into “letter carrier routes” … basically clumps of 300-ish homes. Use this information as the starting point for designing the areas your people will cover. I divide letter carrier routes in half to make routes of 150-200 homes. It will take a small group of people a few hours to distribute door hangers to that many homes. Follow this link for a handy tool for finding letter carrier routes by Zip Code including ready to use maps … for free! Teams // Challenge various small groups and service teams in your church to take a route or two to distribute. Make sure that someone on the team is designated to keep the group motivated and ready to go! Doing this in a group makes it more fun and also raises the potential that it will get done! Pick Up On Sunday … Do This Week! 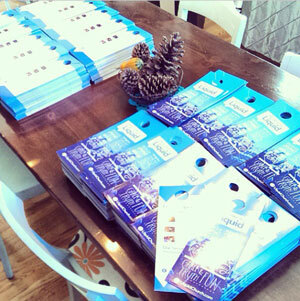 // When I do these distributions we have the door hangers packaged up in bundles and ready for pick up on a Sunday. Although we get people to sign up a head of time to lead a route … anyone can pick up a pack and commit to leading a route. Make sure to have someone leading the distribution of the packs that can “sell” the opportunity to people as they pick them up. People will need positive reinforcement because they will be a bit apprehensive. Participant Handout // Chances are that your people will be nervous to get out in the community and do this sort of thing. Make sure that you include simple instructions with the map of the streets that you want them to distribute the door hangers to. Below is a handout you could download and modify for your use. Wrap this one page instructions up with the map of the route and the door hangers to reassure your teams. Great post Rich! We’ve not done a door hanger campaign in a few years and are thinking of getting one out for our Christmas series. Do you have any suggestions on when is a good time for groups to distribute as far as time of day? Morning or afternoon? Also, how many routes of 100-150 do you guys typically send out? I would suggest that people do the distribution in the afternoon … you got to watch that you’re people aren’t out at night … people don’t like others creeping around their neighborhoods. Make sense? I like to cover 2000ish homes … for a recent campus launch we did about 3,000 homes (20 routes) which is a lot groups to find who are willing to do this sort of thing. Hope things are great at the Ridge today! The manageable routes tip is not something that I considered in the past. I am now in a town of 2k, and that will be very helpful.